“Congratulations on a great run. Now, I know what you’re going through because saying goodbye to a career that you love is never easy. I’ve been there. In my case, though, I didn’t really have a choice. My knees were shot, so I had to give up basketball forever,” Obama joked. 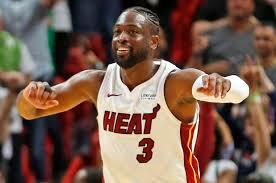 Wade, 37, will retire at the end of the 2019 season. The Heat also honored him with several touching tribute videos before the team’s tip off against the 76ers on Tuesday. The guard has spent 14-plus seasons of his 16-year career with the Heat. Wade is a 13-time All-Star, eight-time All-NBA performer and three-time NBA champion, winning each title with Miami. He finished Tuesday night’s game with 30 points, three rebounds and three assists in Miami’s 122–99 win over Philadelphia.